Quest for the Arab Startup Formula: Fibonacci Numbers are for Rabbits!!! In Highschool we studied about Fibonacci Series until it haunted us in our dreams... but I never knew that the origin of these numbers is ..... RABBITS!! 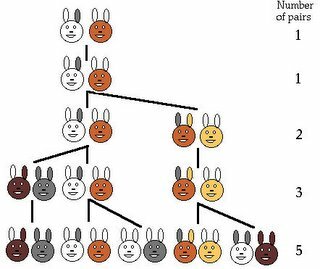 How many pairs of rabbits can be produced in a year from a single pair if each pair produces a new pair every month, each new pair reproduces starting at the age of one month, and rabbits never die? On a more serious note, The Liber Abaci (Book of Calculations) is considered to be the book that brought Arabic Numberals to the west. But how did this book do it? - It did NOT baffle the scientists of the time. The book simply appealed to the merchants and not the academics. The book showed how Arabic numerals were much easier to use for commercial use, like profit-margin calculations and compound interest, than latin number. This idea of making science "relevant" and useful to the people is very powerful and mostly overlooked. During 12 years of school, knowledge was forced into my mind because the teacher considered it "important" and "noble"... but very few things were actually useful and relevant to a boy living in Jordan. I know now much more about "Pteridophyta Plants of the Dinasour era" (سرخسيات وأبواغ) than the plants of the Jordan valley. In graphic design, we prefer candidates with institute diplomas over university graduates. Commercial institutes teach all the skills that are actually needed to do the job. University students usually need another year of training to get going. We need a new original look at our curriculums to connect them to the real markets around them - to create that feedback cycle between what is studied, researched, and implemented. I've heard that JUST does a better job in that than UJ... I don't know, but I hope so. I know it's been posted for a while, but I just came across it. I would like to comment about the University graduate thing. Nice comment - thanks. And it's never late to send me comments. I always read them. I would say that "The [good] schools [should] try to assimilate the information you need..." I think that Most of our universities copy-paste what other universities look like. I don't think that our college-education is well-customized for our local and regional markets. Save few departments, most of the professors are totally divorced from the market, and their concept of real-world needs and requirements are the same as that of the average person. I know that in the west, there is a different between technical colelges and universities. A technical college give you practical compressed educationl. University gives you wide and varried knowledge in humanities & technical issues. I have no problem with this. But I really hate to see universities (and school) teaching about out-of-date unrelated subjects to our society. I think we can do much better. I'm very interested in the design of university education, and I think it's the main reason we lag so much behind 1st world countries. Inshallah I'll get around to writing about this further on my blog. I would love to get your feedback.